I didn’t want to buy a really cheap 12V-34V boost converter because of the unknown quality of the components and circuit performance and it would be fun to build an entire board from scratch. I will design it to have dimming capabilities since I was going to use the driver for studio lights and for general lab lighting. The lighting in my lab is really bad, 1X 15W fluorescent light in the middle of the room. I decided to design my own led driver in the summer of 2014. I started off researching how to drive high-output LEDs. The best way to drive them is with a constant current. As the LEDs heat up, the forward voltage of the led drops . 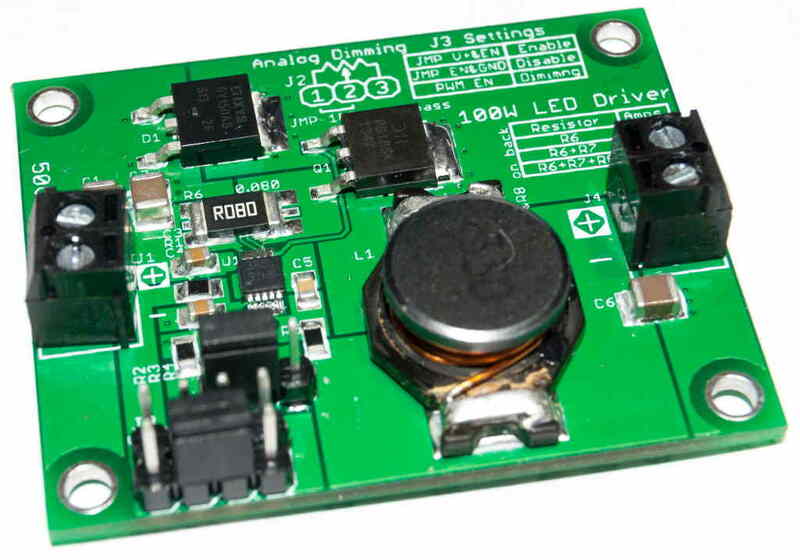 This leads to the current increasing through the led with a constant-voltage driver. This can lead to further heating of the LEDs and might result in a thermal runaway which eventually can melt internal bond wires. A constant current driver fixes the problem by varying the voltage to keep the current constant. The second issue was whether to use a linear drive system or go for the more complicated switching driver. I did a few simplified equations to figure this out. My hypothesis was that the switching driver would be more efficient because the linear driver will need to dissipate the excess power. Using the formulas below and a white 100W test led , the power dissipation of a linear converter was calculated. At this point, I didn’t have any components picked out so I must have skipped calculating the efficiency of the switching converter. Switching converters have switching efficiencies around 80-90%. I will include the calculation now since I have completed the design. The figure of 98.7% seems kind of high, practical measurements are needed here. I decided on a buck configuration because of the increased efficiency over boost designs . Efficiencies are similar for buck and boost converters if the output voltage from the boost converter is less than 3-4 times the input voltage. The wire coming from the power supply will carry less current resulting in fewer cable losses over a boost design. A 12V supply will need to output 100W/12V = 8.3A. A 48V power supply will only need to output 2.08A. I did a search on Digikey for led driver chips. I limited the search to drivers that could survive up to 60V with a current capability of 3.5A. PWM also needed to be an option. I picked the LM3409HV IC because of the simplicity of the reference circuit while maintaining high current accuracy. The calculations for components is presented in the PDF document below. The files for this project are uploaded to github. I created the schematic and PCB with Eagle PCB Design software. The current on the 2.5A and 3.0A ranges are stable with a minimal current error. There is an issue with the 3.5A range, the system goes unstable and the current rises to about 4-5 amps. The led driver does not get too hot when it is operational. I am using the PCB as a heat-sink. At 3.0A, the driver gets warm to the touch. I would recommend airflow over the PCB when operating at 3.0A.